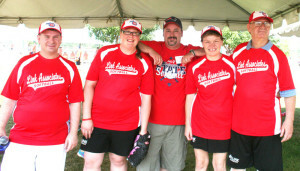 Rick King (center) became an SOIA softball coach when he learned of the opportunity through Sammons Financial Group. The Special Olympics Iowa State Softball Tournament has been sponsored by Sammons Financial Group since 2010. The company not only donates money to keep the event going, but lines the softball fields with volunteers each summer. One of those volunteers loved the event so much, he became a coach for one of the Link Associates team. Rick King is a process improvement consultant for Sammons and has coached softball and baseball for 15 years. The fear of heights is one of the most common phobias in the world…but why let that stop you? 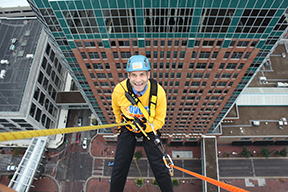 Over the Edge is a unique opportunity for individuals and organizations to raise money and support SOIA athletes by rappelling off the 345-ft Financial Center in downtown Des Moines! Participants must raise a minimum of $1,000 to guarantee a rappel spot. Space is limited so fundraise early! Want to toss your boss? Your fearless leader may not seem so fearless when it comes to dangling over the side of a 345-ft building. Start a petition and generate excitement in the office so that your boss can’t say no! SOIA athletes and their families are invited to Iowa’s season opener at great discounted group rate pricing. Click the link above to order online or call Bravo Sports at 319-626-8286. The Special Olympics Iowa State Softball Tournament presented by Sammons Financial Group will have a new look this year, moving to the Prairie Ridge Sports Complex in Ankeny. The move will allow more athletes to participate in a wider variety of activities. Last year, 24 traditional and Unified Sports teams participated in the tournament, with more than 300 athletes representing 17 communities across the state. SOIA officials expect that number to grow this year and are excited to be able to offer a softball skills competition at the new venue. Pigskin Madness Tickets on Sale Now! We’re gearing up for the NFL season and our annual Pigskin Madness tickets are on sale now! For just $20 you have eight chances to win each week of the regular NFL season — that’s 17 weeks of play! Want to help your friends get in on the fun? We will send you a book of 25 ticket to sell — you do not need to pay anything up front. Just turn in the sold tickets and money to the SOIA state office. Questions? Contact Jeanette Steinfeldt at 515-986-5520. Special Olympics Iowa honored its Outstanding Athlete, Coach and Family of the Year award winners during the Summer Games Opening Ceremony presented by Hy-Vee May 21 at Iowa State University’s Hilton Coliseum. The Scott Bryant Unsung Hero Award was also presented to recognize an individual dedicated to the Law Enforcement Torch Run program. Danny McDonald has been in Special Olympics for more than 30 years, competing in bowling, bocce, track and Challenge Days. 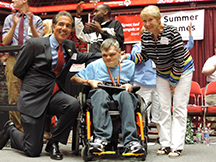 He had the opportunity to compete at the 2006 National Games in Ames when our Challenge Day was showcased for three days to people from all over the United States. It was nothing but pure fun for this athlete, making new friends and competing with athletes from all over the country, playing basketball and volleyball. Danny is one of the friendliest, kindest and most loving people you will ever meet. He is always ready to shake your hand after he competes. It doesn’t matter if he gets first or last place; to him, he is a winner because he gets to participate. Mark Robinson, Lisa Spencer and Patrick Gulbranson are part of the Iowa delegation of Special Olympics USA. Special Olympics Iowa bowlers Patrick Gulbranson (Stuart) and Lisa Spencer (Ankeny), along with aquatics coach Mark Robinson (Cedar Rapids), have been named to Special Olympics Team USA and will represent the United States at the 2015 Special Olympics World Summer Games in Los Angeles, Calif., July 25-Aug. 2. Gulbranson and Spencer each earned a gold medal at the 2013 Special Olympics Iowa State Bowling Tournament, qualifying them to apply for a spot on Special Olympics Team USA Bowling. They are among a 491-member delegation representing the United States in competition in 17 sports. There are many levels to Unified Sports. 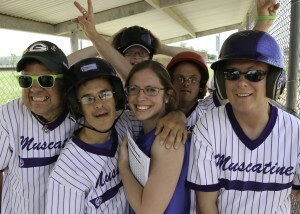 Special Olympics Iowa Unified Golf follows the guidelines for Unified Development: paring up athletes (individuals with intellectual disabilities) with partners (golfers without intellectual disabilities) who are more knowledgeable about the sport to compete in a team environment. Need to quench your thirst? Stop at Casey’s to get the SOIA Casey’s Cup this summer! 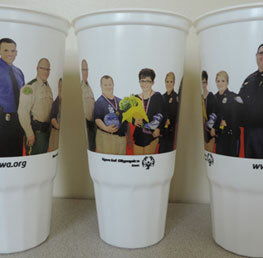 Special Olympics Iowa athletes and law enforcement officials are being showcased on the 44-ounce cups at Casey’s General Stores throughout the state. The cups will be available in stores from Memorial Day through Labor Day with a portion of the proceeds from each Casey’s Cup sold going to SOIA.